In a previous post I talked about my glorious adventure at Taco Libre. 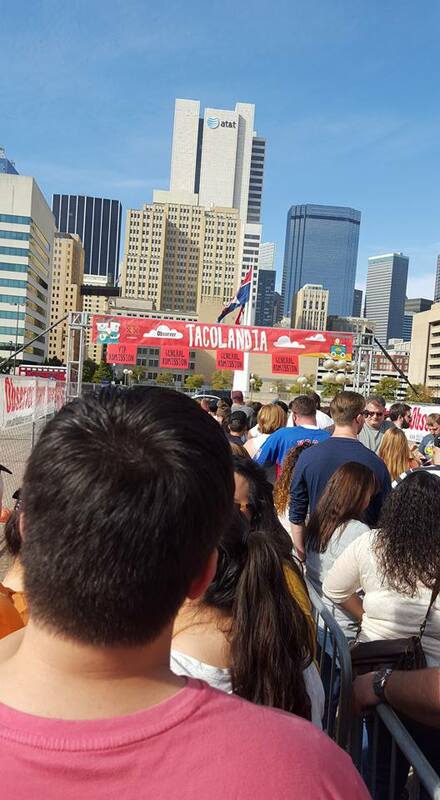 The first, all taco all the time, festival held in downtown Dallas. 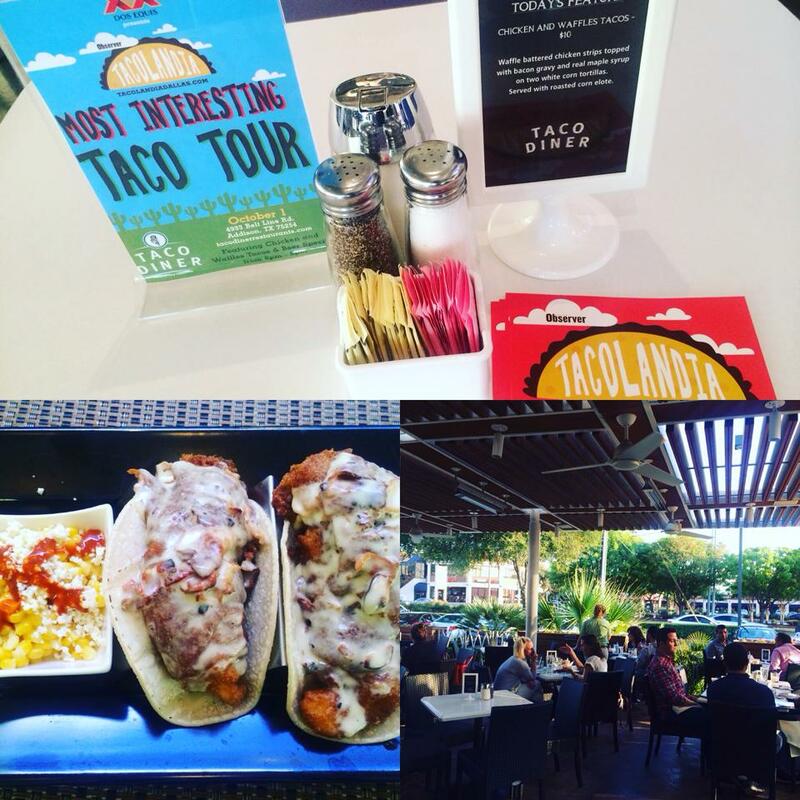 Tacolandia is the Dallas Observer answer to Taco Libre. I realize the easiest way to go about this is to compare and contrast the two, because essentially they’re the same event with a slightly different name. Tacolandia took place at the Dallas City Hall Plaza, which is a nice, basically concrete, area of land with a small green patch and some random sculptures. My team (my brother, his girlfriend and my boyfriend) and I arrived about 10 minutes before the gates opened. I learned from Taco Libre to get there a little early unless you want to wait for an hour. Gates opened, we were given some boxes to hold our tacos and a voting chip and were free to eat. And when I say free to eat, I mean that in every sense of the term. It was free to eat. The cost of food was in the cost of your ticket. So close to the entrance. I want to eat TACOS! 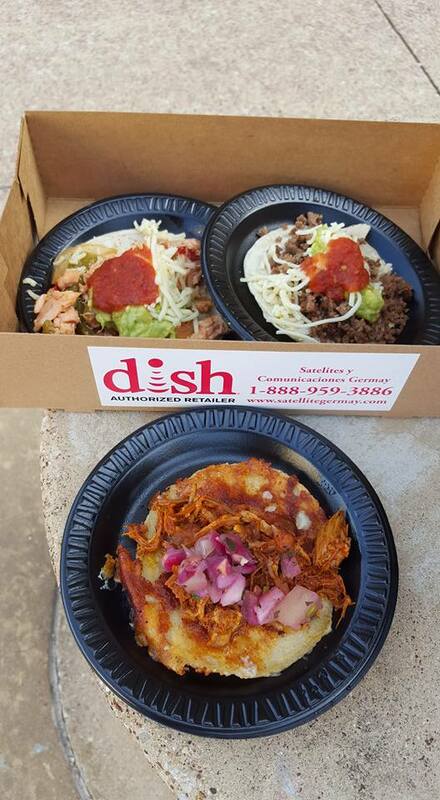 They had 28 vendors serving their version of a taco. Wait, let me correct that statement. They scheduled to have 28 different vendors but I know some didn’t show up like Torchy’s Tacos. I’m disappointed in you Torchy’s. I love you so much and to see you willingly ignore an obligation you agreed to made me feel like your mother. Shaking my head in shame and sadness. Most were street tacos and like I’ve said before, there are only so many meat, onion, cilantro tacos you can eat before you get bored. But there were some variations. Velvet Taco wins for most unique with a Chicken Tikka Taco. An Indian-inspired taco with basmati rice and Thai basil. My brother and his girlfriend voted them to be the best taco based on sheer creativity. Val’s Cheesecakes, whom I actively follow on Instagram, created a taco cheesecake. Yep, taco…cheesecake. I’ll wait for that to sink in. It is exactly what it sounds like. Taco flavored cheesecake. Against my better judgement I tried it and my gut was right. Cheesecakes are meant to be sweet not savory. It was too weird for me and I can’t say I was a fan. But I’ll try a cheesecake one of these days. I had more than one salmon taco, on accident. It was about 80 degrees that day and salmon was just not something I wanted to eat. That’s like asking for food poisoning. Kozy Kitchen was one of those salmon tacos, which I had one bite of and threw out because I refused to waste precious stomach space on tacos I didn’t want to eat. One or Done. One bite or I finish it. No middle ground. They also had a buffalo taco, which was fine but not great. Another one bite wonder. Taco Diner had a chicken and waffle taco. Freaking CHICKEN AND WAFFLE taco. When I first walked by they didn’t have any ready and when they finally did the line was ridiculous so I missed out on it’s wonder. But props for the idea. I was actually extremely disappointed that I missed out of that taco above all others. I was so curious of this taco that when I recently went to Taco Diner I ordered it and was not thrilled. 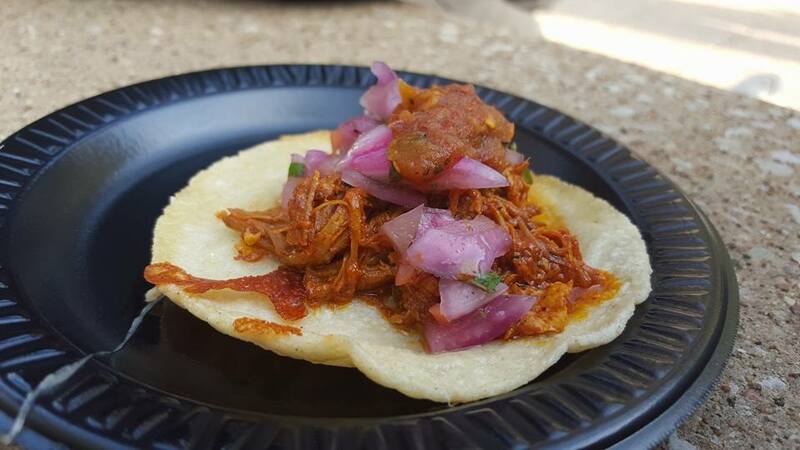 In the below picture the chicken at Tacolandia was obviously fired to a crispy goodness. At Taco Diner the chicken was breaded in an egg batter like tempura and that was a mistake. The batter didn’t hold up well enough to the sauce and the maple syrup. You lost the texture, which an egg batter already doesn’t offer much of, rather quickly. Fried chicken Taco Diner, or none at all. Lazaranda had my favorite taco of the day. It was a pulled pork taco but the sauce was just this side of salsa and the pickled veggies were on point. Plus, they put the cheese on the bottom AND they threw that on the flat top so it melted and just started to crisp up. I ate one, loved it, waited in line for 10 minutes to both give them my vote, along with the boyfriend, and eat another. Check out that glorious winner! Well my personal winner. Besides the food, Tacolandia also took things a little further for its patrons. There was a DJ pumping out some tunes. They had the only grass area set up with bags, massive beer pong, horseshoes, just some fun lawn games. There were some photo-opt areas throughout plus an actual photo-booth area hidden among the taco vendors. They also had people doing Sugar Skull face paintings, which actually looked legit. Those people did a good job. The only thing you needed to pay for inside the event was drinks. But all drinks. Alcoholic and non-alcoholic alike. If Tacolandia and Taco Libre got together and had a baby, that baby would be “The Best Damn Taco Festival in Texas” (I’m claiming that name). Taco Libre did great with publicizing the event. It was packed. Again, had to wait an hour to get in and the event sold out. Tacolandia was not so packed (which isn’t really a downside as a customer but as a coordinator not exactly what you want). It was out on social media but I don’t feel like it was as much as it could be. Taco Libre paid for social media ads, either got local food bloggers to advertise on their social sites or were out there enough that bloggers just went ahead and promoted it themselves. Leading up to Taco Libre I couldn’t escape it. Tacolandia was really only promoted in the Dallas Observer. I did see an occasional flyer here or there, but I didn’t see anywhere near as much of it on Insta nor did I see much on Facebook. It was there, but not as predominate as it could be. Taco Libre had bands. Granted they were more Mexican bands and that’s not really my thing, but live music is nice. Tacolandia had a DJ. He did music. But no one really cared. Tacolandia was 21+. No damn kids ALLOWED! That was the best. No kids running around, no strollers, no crying. I was so happy to not have to deal with children under my feet while navigating tacos. I’m focused. I’m in the zone. My taco zone does not include me making sure that I don’t murder your children. Tacolandia was smart to include the cost of food in the ticket. And the ticket prices weren’t outrageous either. I got my tickets on sale for National Taco Day, they were 40% off, so that knocked the cost down to $15/ticket. $15 for all you can eat tacos is a deal to me. Hell, $25 still isn’t that bad for all you can eat tacos. Taco Libre had it that you had to buy tickets, then buy tacos, and buy beer. It was a mess of money. Here, I didn’t have to pick and choose with tacos I ate because I didn’t want to spend $100 on tacos alone. Tacolandia was in the “fall”, which in Texas still means summer. That was nice. The weather that weekend was in the 80s. It wasn’t blistering hot like Taco Libre was. The outdoor space offered a variety of locations to sit when Taco Libre offered only the grass and, fingers crossed, you didn’t get stepped on. Now, to be fair, Taco Libre’s location was visually more appealing, taking place in a park, but Tacolandia was more…user friendly. This is how “The Best Damn Taco Festival in Texas” needs to work. Cost of food included in the ticket, more advertising on social media, done on or around National Taco Day (puts your solidly in early fall, plus give it more of a “national” reason which could up the attendance rate), keep the outdoor activities and keep the music. 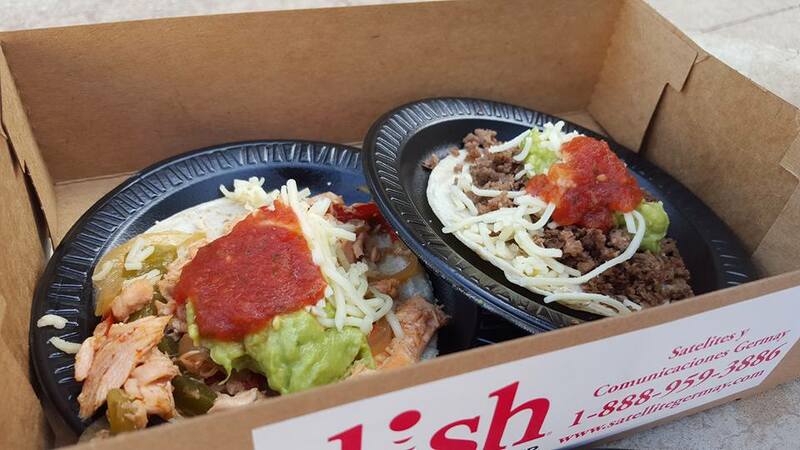 Put that taco in your box and eat it!